...but keep your finger out of your nose. Too many threads about best burgers, types of burgers, and too little visual proof. So how about a thread preferably with photos giving us your best shots? They can be restaurant or home grilled. The idea is to try to tantalize you despite the fact you can't taste through your computer screen. I'll kick it off with one I had Monday night at Ike's Food & Cocktails in Minnetonka, MN. It was the Ike's Roadhouse Steak Burger, a 10 oz. blend of ground Angus chuck and Prime Rib on a butter toasted onion bun with Widmer aged cheddar, sauteed onions and crispy onion strings. This one might give incentive for BuddyRoadhouse get his BBQ sauces back in the Twin Cities grocery stores so he can visit more often. If only that was all it would take to reenter the Twin Cities market. Nice looking Burger. To heck with business-I might just make that a reason to visit on vacation. Here is one you remember well from the Lion's Tap in Eden Prairie, MN. 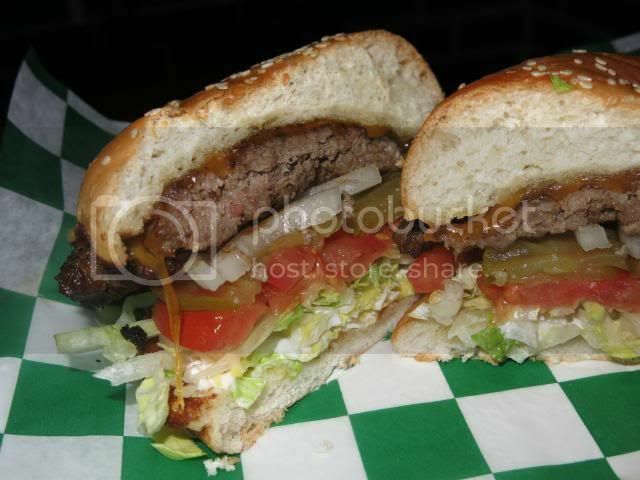 The only burger I have a pic of is my usual from Terry's Turf Club in Cincinnati. It's easily the best burger in the US, IMHO. This one was Medium Rare with Gouda and Mango Curry Sauce. The buns are really nice, too. This is my go to when we stop in there. Not a good picture but the Diamond Burger from the Diamond Bell Saloon / Strater Hotel in Durango CO. 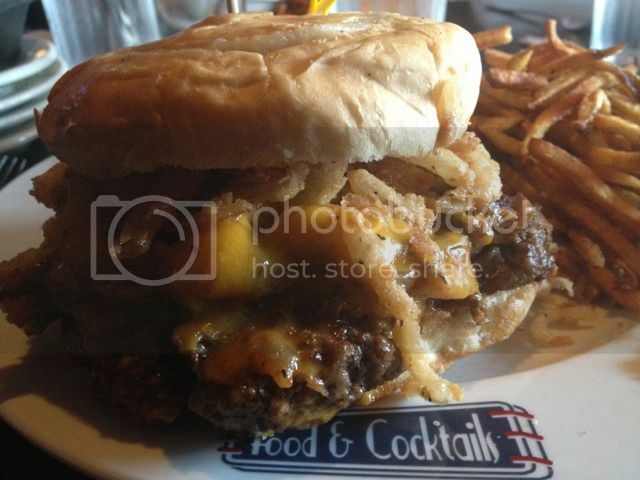 The house-made “Steakburger” is where we began. We wanted to provide a savory, high quality burger, made from the finest cuts. A 10 oz. patty made from New York Strip, Rib Eye, Filet & Beef Brisket trimmings. . . .
A semi-soft, pasteurized cow’s milk cheese from Pays de la Loire, France. It is renown for its orange crust and a mild creamy flavor. This cheese was developed by Trappist monks during the 19th century at Port-du-Salut, Abbey. French Revolution of 1789, learned cheese-making skills as a means of survival and brought those skills back with them upon their return in 1815. Pancetta is an Italian bacon that is cured with salt and spices, but not smoked. It is slightly salty but very flavorful. An aioli is a fresh made garlic mayonnaise that originated in the Provence region of France.We have taken it to the next level, with roasted garlic and Dijon to add some zing. For this element, we have slowly cooked yellow onions until the natural sugars in them caramelizedto give them a deep sweet and savory flavor. We then added apple cider to enhance the sweetness. with just the right amount of texture. Almost good enough to eat on its own. . .almost. Don't miss the Home Style Burger at Midway Eat in Random Lake, WI. Great idea for a thread! There are already so many appetizing burgers on here, but I want to play, too. 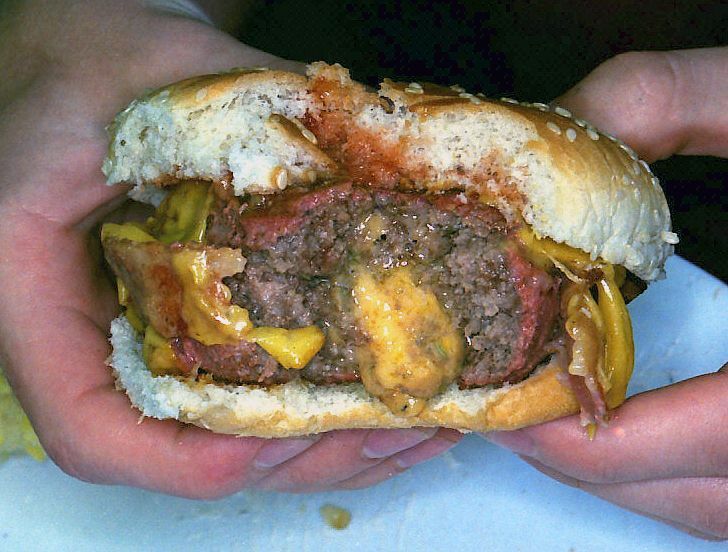 This is known as the squealer at Tookie's in Seabrook, Texas and it gets it's name because they blend bacon in with the fresh ground beef. What, no pix from Tessaro's? Cheeseburger, cooked medium with the works (lettuce, tomato, onion, pickles, ketchup, mayo and mustard) from the Burger Joint in the Le Parker Meridien Hotel in midtown Manhattan, NYC. I split this with Chris & Amy (ayersian) back in Feb. 2012. I know many frown upon a plethora of toppings but they really are fresh here and the quality beef really does shine through right from the first bite. Not that you can see too much of the beef from this photo! I love Tessaro's as much as the next guy, but I have probably posted a half dozen of photos from there over the years. And I have hundreds of burger photos from other places! 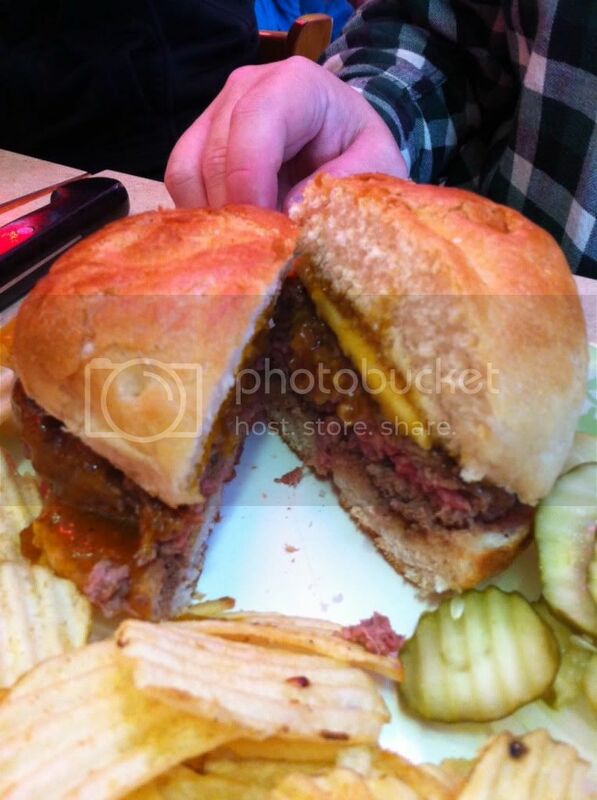 It's OK to repost your best and most tantalizing burger photos. I just got tired of looking all over and then reading those 50 best articles. I figured collectively we have more right here from Roadfood members. Scattered around in several threads you would never know. at Bode's General Store in Abiquiu. Bonus points for the tater tots! 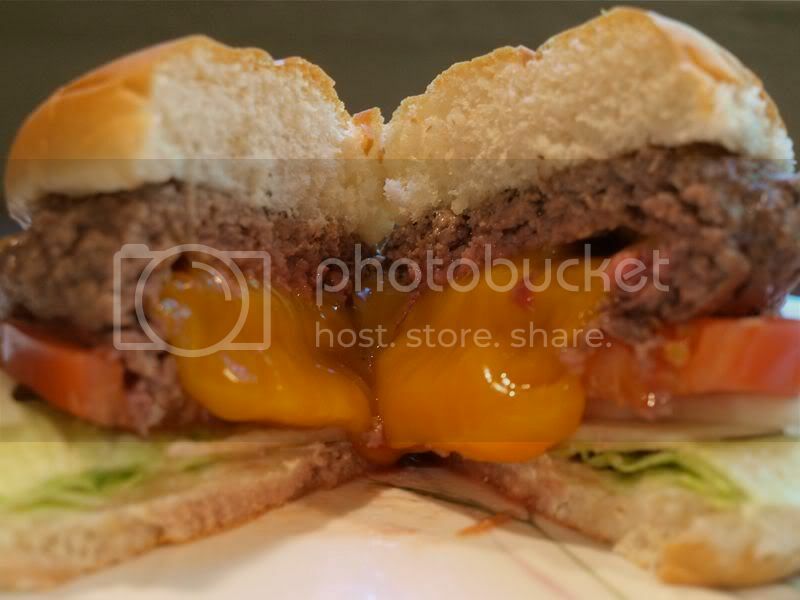 Those are some amazing burgers and photos. On the top photo, with the mac and cheese falling out, what kind of bun is that? It almost looks like an onion ring, but that can't be. The fried mac and cheese bun is part of the the signature menu item at Zombie Burger, The Walking Chedd is more like viral internet marketing fodder than an actual edible sandwich. 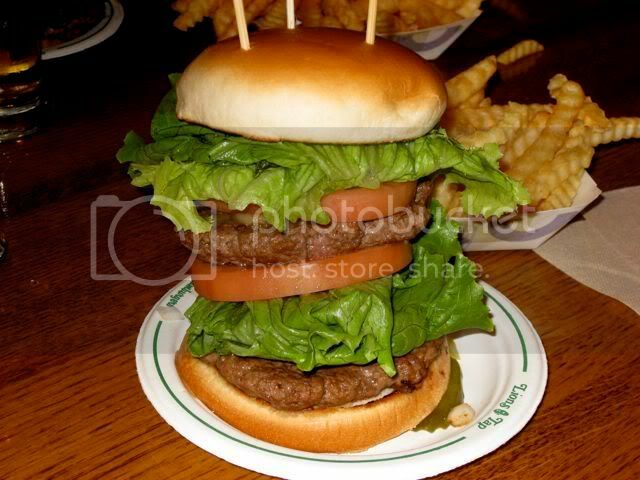 Its nearly impossible to keep the bun balanced on the burger for the picture. The restaurant was so successful at launch two years ago that they ran out of food regularly for a couple weeks. You can't argue with success like that. 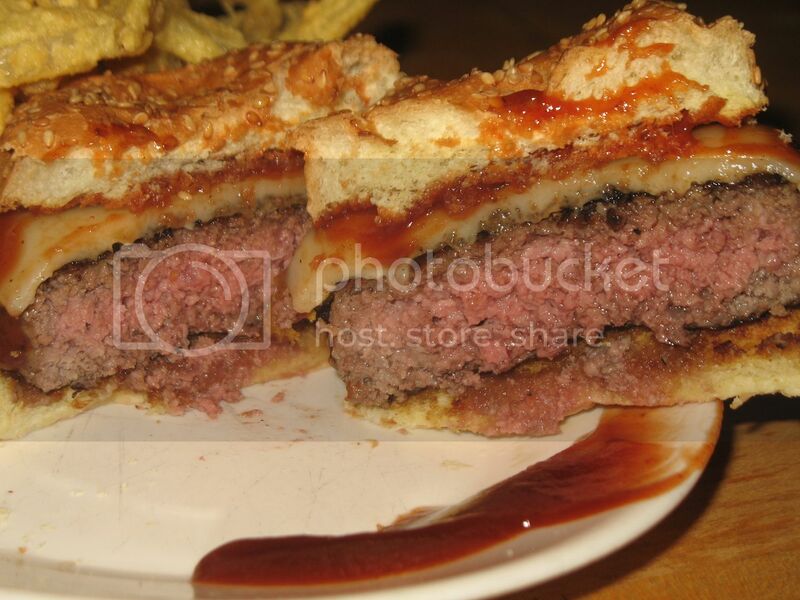 It looks like a burger you would have to try once but probably would not a second time. Has business dropped off since or are they in a location that will continuously get new people, like tourists? 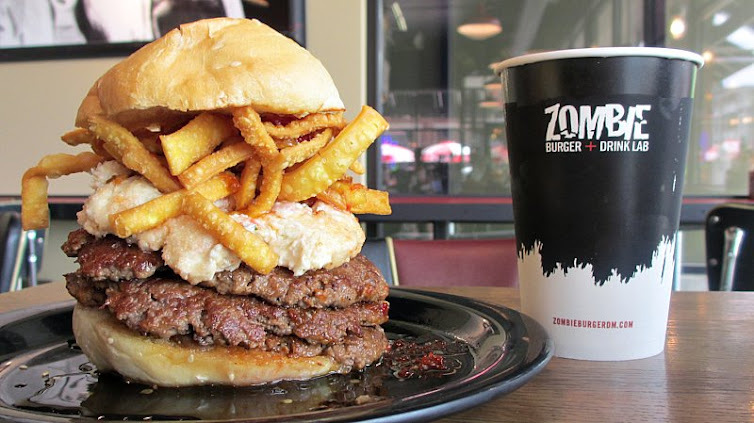 Thanks trzhotel for bringing Zombie Burger to our attention! I know where I am going now next time in Des Moines. What is your favorite burger there? How are the milkshakes and fries? I did say we could post our own homemade burgers as well. 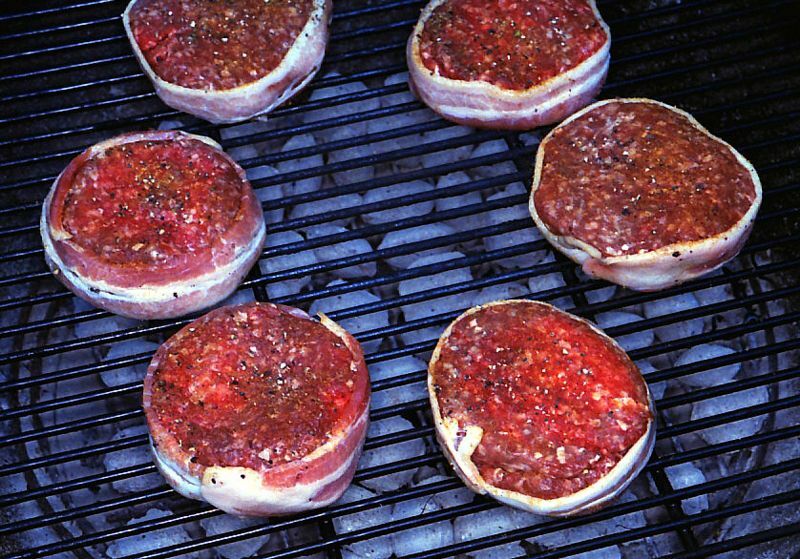 In Minnesota, a popular type is the Jucy Lucy usually fried on the flat griddle and not grilled. So I concocted one at home in a skillet, not on the barbie. Turned out pretty good, maybe better than Matt's Bar, The Nook and the 5-8 Club best known for them. The idea is to let them cool down a tad before biting into them or you might get a scalding burn from the cheese. With this one, for the photographic effect, I cut it in half before eating. Ahhh Davyd, that homemade Jucy Lucy looks just right! CK, isn't there a special name for the burger at Zaharako's? 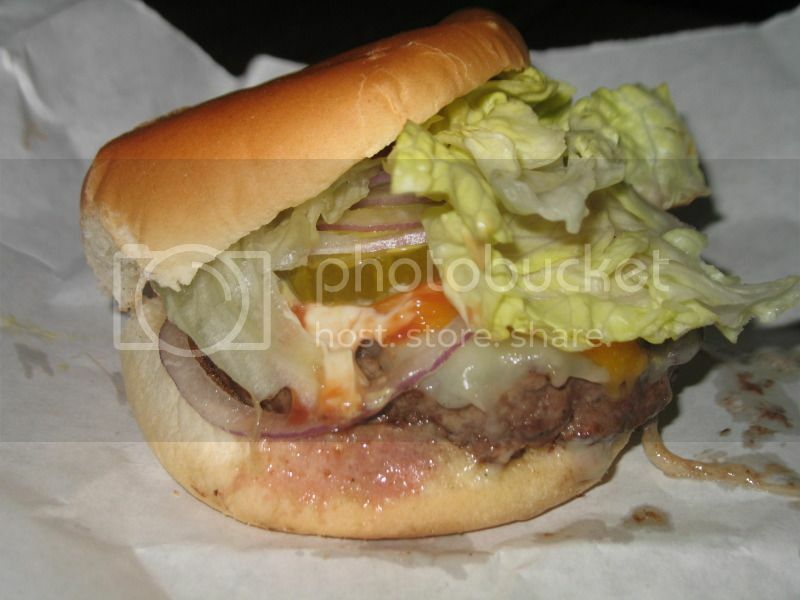 The "Mitt Romney" burger (swiss cheese and grilled onions) in Nov. 2012, ordered medium, from Mr. Bartley's Gourmet Burgers/Bartley's Burger Cottage in Cambridge, MA. 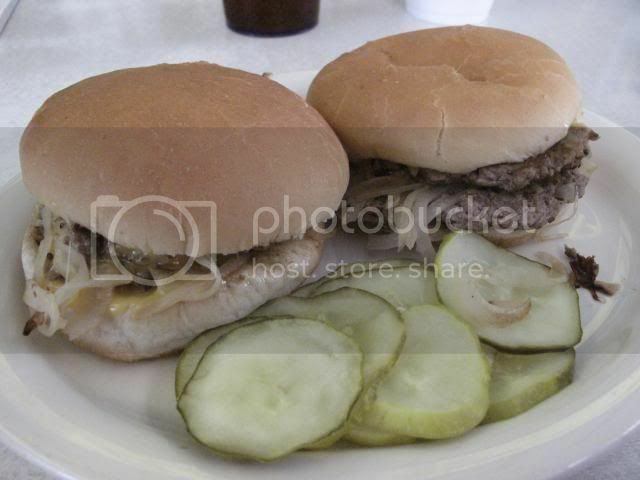 Sliders from Hunter House Hamburgers in Birmingham, MI. You will definitely have onion breath after knocking down a plateful of these. Jucy Lucys were on the grill when we were on vacation last month. To help keep in the cheese I've designed the BaconShield (patent pending). Brad! There are no words!! 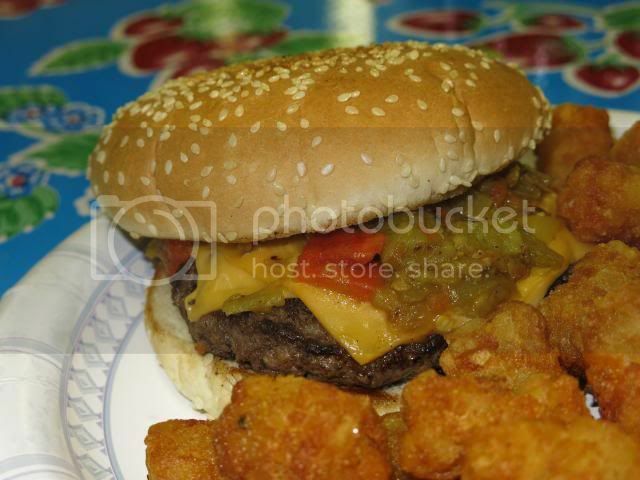 On HollyEats.com, Holly Moore has a picture of a Dilly Cheeseburger from Dilly's Corner. That is one of the best burgers I have eaten. Zaharakos = "The GOM Cheese Brr Grr"